 Log In needed $1,680 · Wood Cookstove Ranges New Amish Made ULC Certified Order Now! We have 7 different models to choose from of Certified wood cook stoves made by Amish stove manufacturers starting as low as 1,680.00. The Baker's Choice, The Pioneer Princess, The Pioneer Maid, The Gem Pac, The Flameview, The Margin Gem, & the Fireview by Elmira. We have every model on the showroom floor for you to view by Appointment Call Rick @ 519-842-5290. 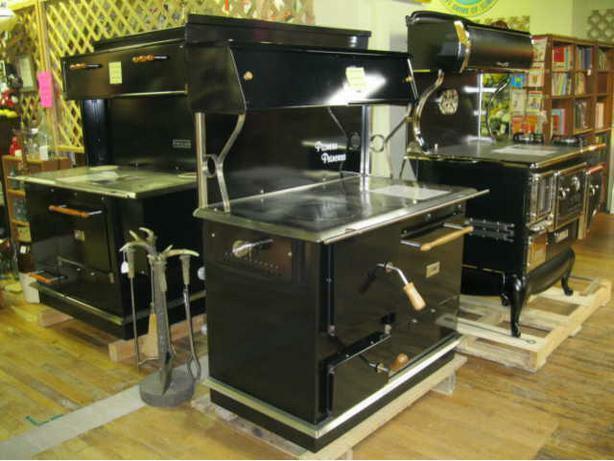 You can also check them all out on our website: http://www.antiquestoves.ca Put your order in early to avoid further delays. We ship all over Canada and our shipping rates are excellent. Crating fee for shipping. Allow 4-10 weeks depending on the stove of your choice for the manufacturing of the stove. Stoves are ULC approved. All stove orders are to be pre-paid as these new wood cookstoves are custom made to our customers request. Call Rick at 519-842-5290 in Courtland, Ontario for pricing & Shipping Quotes.